Societies can rise or fall based on the quantity and quality of their public spaces. New decent public spaces are rare and precious is the day when there’s a chance of a new one. Does it matter if you live near that proposed space? No. Any new public space is a beacon to the world, showing that we need and can have public spaces everywhere. 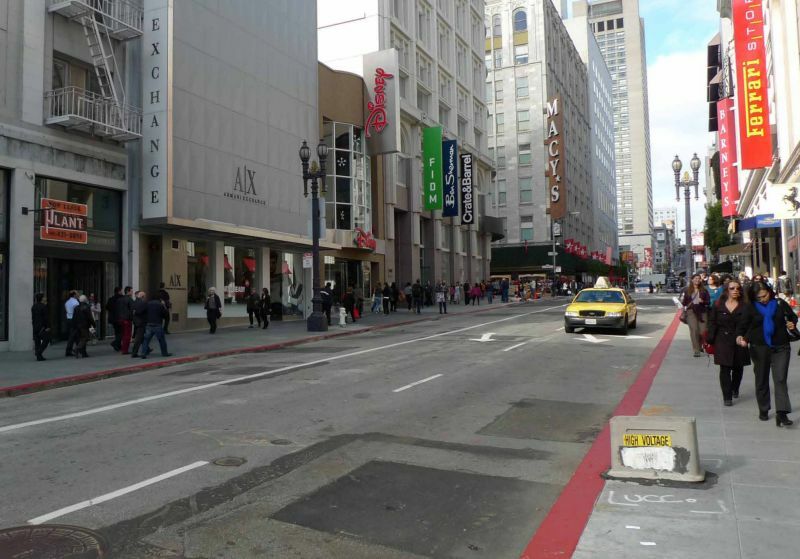 This is Stockton Street in downtown San Francisco and the conceptual rendering above is from the Lower Stockton Improvement Project. 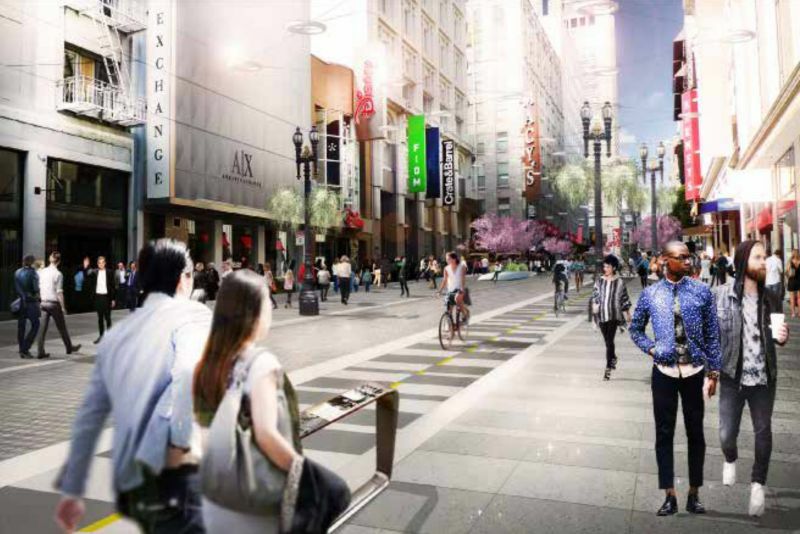 The project would turn three blocks of Stockton from yet another auto sewer into a car-free pedestrian-transit-bicycle mall. People would flock to the space, bus and bicycle access and safety would improve, and merchants would be jumping for joy. Here’s the backstory behind this project. See here for the full proposal and below for more visuals. The bad news? It might not happen. The San Francisco Examiner reports that Rose Pak, a prominent power player in nearby Chinatown, is claiming to represent Chinatown merchants in an effort shut down the project. And she says she’s already won. “I consider the issue closed,” says Rose. Here’s where you come in. We need you and as many people as possible to tell the powers-that-be: Keep the Lower Stockton Improvement Project alive. If we don’t mobilize, the project could be stopped in its tracks. But if we step up, the results could be a game-changer, not only for San Francisco but for towns and cities everywhere that notice what San Francisco does. So, sign the Lower Stockton petition today – and tell your friends. It’ll go to the parties listed below, the folks who will decide the Project’s fate. I also suggest editing the petition’s message to fit your own voice. This is worth your time. Once you’ve signed the petition pat yourself on the back. You’re a star. Now, sign the petition! (click on this link and scroll down to the Lower Stockton Improvement Project petition form). Thanks Adam, from Streetsblog, for putting this effort together! How Has Chinatown Stayed Chinatown? – New York Magazine is a good article to read on the incredulous staying power of Chinatown in NY. Third Point. Yes, people drive to Chinatown to shop, and you can show examples and relate to those people, but it’s a tiny amount of the pie. Though auto-traffic is conspicuous – traffic looks like economic vitality. Truth is the many residents of Chinatown (like me) who, often propped up by food stamps and public housing/assistance are keeping the markets alive. 85% of Chinatown residents don’t own cars, they eat every day and they are spending their money IN Chinatown. Rose Pak will be awarded a lifetime achievement award by SPUR. Ugh.